Everyone wants to be king of the zoo, but no one more that Carlos the chameleon. The funny cartoon animals are visited by a young girl and her grandmother following the map at the front of the zoo. Many of the animals claim to be king, making Carlos get more and more upset. It never says so in words, but diligent observers will see their friend changing colors on page after page. They will feel sorry for him and then cheer for him. Carlos has wonderful facial expressions that children will be anxious to copy. The beautiful watercolors are stunning as well as entertaining. 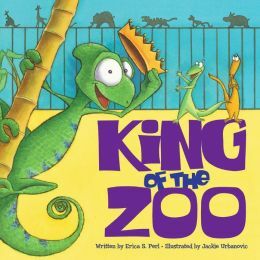 The animals might not be able to agree on exactly who is King of the Zoo but the zoo guest and her grandmother know by the end of the story. This story is on a second grade reading level. Picture clues will add to their comprehension of what is going on and what special gift makes Carlos a very special animal. Literacy skills of dialogue and narration can be identified in the text as well as sequencing in discussing which animals were visited first, next and last. Preschoolers as well as first and second grades will enjoy having this story read aloud. PUBLISHER: Orchard Books, Scholastic, 2013.